In 2004, Seth Holmes, a young American physician and anthropologist, undertook a trip that few take for kicks: He migrated from the rural highlands of Oaxaca in southern Mexico to the deserts of Arizona alongside a band of indigenous migrants bound for American farm fields. 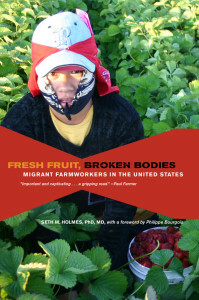 They were apprehended by the U.S. border patrol, but Holmes’ work detailing the human cost of American agriculture continued. Begun in 2003 in Washington state, and stretching to Oaxaca, Arizona, and California’s central valley, Holmes’ research spanned nearly two years. He picked berries and pruned grapes; lived in labor camps and at times his car; and, most interesting of all, got to know—and observe—his new neighbors and colleagues. Nearly a decade in the making, his new book, Fresh Fruit, Broken Bodies, is a thoughtful exploration of the true cost of cheap food, earning Holmes a post on prominent NPR broadcasts and in lecture halls. Struck by the strange common ground Holmes work gave us—I have also reported and worked alongside Trique immigrants—I caught up with him by phone to talk about crossing the border, America’s corn subsidies, and how living as a migrant worker changed his thoughts on food. What was it like to make the border crossing from Mexico to Arizona? It was terrifying. I knew how many people died trying to cross the border each year, but doing it physically with my own body and my own mind and emotions and psyche was a much more intense than I had realized it would be. It was a long process and there were a lot of different ways that things could have gone worse than they did. We came across rattlesnakes and other people who we weren’t sure what their intentions were, if they were assailants or robbers or vigilantes or just other border crossers. There were times when different people in our group would run into cacti in the darkness because you obviously don’t use a flashlight if you’re trying not to be seen, which makes going through the desert an especially dangerous process. [In the book, Holmes tells the story of his trip, starting with a 49-hour bus ride to the border; roughly $2,000 in guide and ride fees, including payment of the coyote; off-roading it in the desert and sleeping in creek bed.] We were apprehended once we were in Arizona by the border patrol. For my Trique companions, that was a huge deal because they had to do the whole process [go home, migrate to northern Mexico, pay a coyote and make the crossing] again. Was migrating something that the folks you worked alongside wanted to do? They understood it as something that they were forced into, [It was] not something where they…weighed pros and cons or all those things that we tend to assume about migration. Even academics who do migration studies often write about the push and pull factors and the way that immigrants weigh those factors and then make a choice to immigrate at a certain point. But the Trique people…none of them ever talked about weighing pros and cons or making a decision. The only decision they ever talked about was, ‘Who’s going to migrate?’ because every family in their home village had at least one or two or three people in the U.S., working and sending money back. What was the big reason that folks felt compelled to migrate? What’s driving that for them? They all are basically family farmers in their hometowns, growing corn and beans and different kinds of greens, and some of them have oxen, some of them have goats. They used to be able to sell their corn in the nearby markets and then use that money to pay for electricity or to pay for uniforms, to be able to go to the free public schools, but they couldn’t do that anymore. I was just blown away by how much time you spent actually living with the Trique workers; I spent two months doing that kind of work, and you were there for about two years. Why did you choose to spend so much time? I found it pretty important [to spend that much time]. I spent five months on the berry farm up in Washington state, picking strawberries, living in the camps, picking blueberries, interviewing people. And, the Trique people…I don’t think [they] trusted me very much during that time. There were rumors that went around that I was a spy for the government or the border patrol and there were rumors that went around that I was some kind of criminal hiding from the government. [At first] no one would hang out with me or invite me to dinner or eat food with me or anything. It was really after that five months when I went to California in a big caravan of cars and we all lived out of our cars for a week and were homeless until we found an apartment that someone would rent to people who didn’t have a credit history and credit cards and bank accounts. I think that’s when people started interacting with me more as someone they trusted, or were willing to talk with or spend time with, and I was invited to meals and I lived in that same house with them, with maybe 18 other people. You write about how Anglo teenagers will go and get jobs in the fields for a summer or something like that. How different is a Anglo kid’s summer farm job, how different is that from the reality that the indigenous workers are facing? I grew up in eastern Washington and a lot of my friends told me that they picked strawberries when they were kids and it was hard. From my research, the white kids who work on the farm have a much different job than the Trique people do. The white teenagers would work on separate fields [from the Trique]. They would talk and walk and, oftentimes for an hour or two, and their parents would come and help them pick. They didn’t have to make minimum wage, because they’re under [the age] where the minimum wage law applies in agriculture. So, they would pick at their own speed and they were not pushed the same way. If you’re not a farmer and you think about working on a farm, you imagine gardening and sunshine. For the white teenage pickers, it was a little bit more like that. But…[for] the indigenous pickers, picking is more [one of] wage labor; like working in a factory, but you’re outdoors. They wouldn’t talk to each other. Arms were flying and picking, with each hand popping off the leaves with thumbs, going as fast as you could. Trique people work seven days a week, rain or shine, and they have to pick a minimum weight in order to keep their jobs. [When I was there,] the state minimum wage was $7.16 an hour, and they were paid 14 cents per pound, so they had to pick 50 pounds of berries per hour. California has stronger wage and hour protections for farmworkers than Washington. Did you observe any appreciable difference? The actual working conditions were worse in California. In Washington State, every farmworker was on the payroll of the farm and every few weeks, they got a paycheck. So, the farm was motivated to pay them at least minimum wage and do things largely by the books. In California, there’s a contractor system where the farm would hire one contractor and they were the only person on the payroll [and they would hire people to work for them]. When we had grape and vineyard pruning jobs in California, we were never paid minimum wage; the farm didn’t feel accountable to following the rules with us, because the only person who they had to show that they were paying the right amount of money to—or that they even had hired—was the contractor. You come to this as someone with training as a medical doctor and you talk about the cost to people’s bodies. What does agricultural production mean in terms of the health of the folks working in it? A lot of us who are part of the food movement in the U.S. are interested in what we’re putting in our bodies or our kids’ bodies. 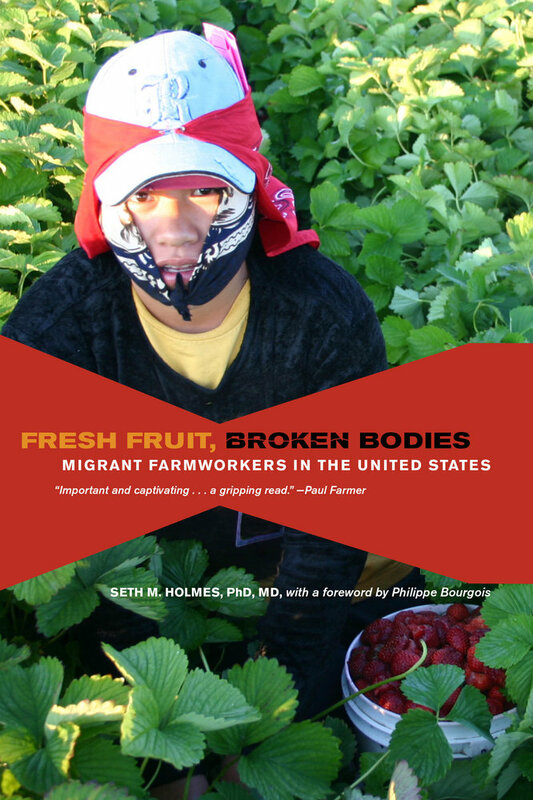 Part of the reason the book is named “Fresh Fruit, Broken Bodies,” is that I see one group of people—partially based on citizenship and ethnicity—giving up their own health. Their bodies are becoming broken and sick because they’re working so hard in these conditions, in order to provide fresh fruits and vegetables for another group of people—the people who shop at the nicer grocery stores and farmers’ markets and are able to become healthy or stay healthy. Something I struggle with is that we could afford to pay workers better; if farmworkers’ wages could go up 40 percent and most Americans’ grocery bill would go up $16 a year. But even if folks are being paid better, if the nature of the work doesn’t change, we still have this pretty damaging physical labor going on. If we were able to fix the wage problem, we could also fix some of the working conditions; people could work less hours or slower. It might be possible, for example, to rotate people around. I think part of what’s needed is also simply the enforcement of labor laws that we already do have; we do have some good labor laws, but they’re not often enforced. How did writing this book change the way you see yourself in the world? That’s a little bit hard to answer, because it’s an emotional answer. It does end up feeling like there’s a way that what I get to enjoy in San Francisco—bikeriding on bicycle lanes and well-kept-up parks, and eating local, organic ice cream, and enjoying nice local, organic restaurants—[that it’s] part of the same system that forces certain people, certain human beings to risk their lives and their sanity crossing a deadly, terrifying desert in order to work in conditions that are really difficult. So, there’s a way that I can’t always do that anymore. Are you still in touch with the people you profiled? I visited Samuel and some of his relatives a couple of times this summer and I visited some of the other people in the book. He’s currently in Madera, California and then I visited some of the people up in Washington State in June and probably will go back to Madera sometime in the next couple months.